Considered by many to be the most precious of all the ceramics made in by the ancient Chinese, Ru kiln china is highly prized by museums and private collectors. The years of the Song Dynasty from 960 - 1279 A.D., were a time of great cultural change in China. During this time many kilns were built throughout China producing a vast array of pottery and porcelain ware. Official government kilns were set up and ordered porcelain made to specific standards of pattern and design. The styles were simple and natural with a light glaze. Along with Ru kiln, the four other great kilns of the Song Dynasty include Ding, Ge, Imperial and Jun kilns. The porcelain of the Ru kiln is considered to be the most highly prized and rarest of all the ceramics made by the artisans of ancient China. This is because of the limited number of pieces that are in existence today. Before the discovery of the original location of the kiln in 1986, there were less then 60 pieces of Ru china intact. The kiln site was found in the province of Henan, Baofeng County in the village of Qingliangsi. Through careful archaeological digging there have been 37 more pieces of Ru porcelain uncovered. Of those pieces, 22 were intact and the rest were fragments. Most of the porcelain of the Ru kiln is housed in museums of China and other countries. The following are the known whereabouts of Ru porcelain. Click on the links below to view several of these highly valued antiques. The Times of Malta shows a rare Ru washer bowl that was auctioned by Sotheby's in 2012. A Ru bowl designed for washing brushed sold for about $38 million. 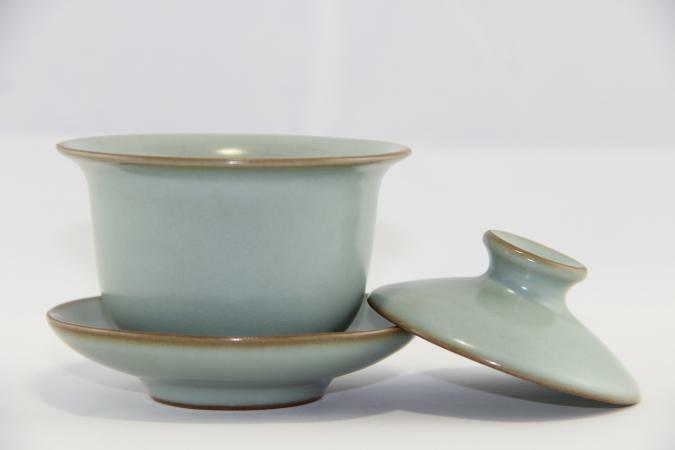 Sotheby's auction sold this fine example of Ru ware. The remaining pieces of Ru kiln china are valuable links to a civilization from long ago.